The Disaster Charter made this Landsat-based map of Bolivár State’s flooded areas available to first responders. Heavy rains in August caused wide spread flooding on the Orinoco and Caroni Rivers in Venezuela. This map was made using pre- and post-event Landsat images acquired on May 13, 2016 and Aug. 4, 2017, respectively. 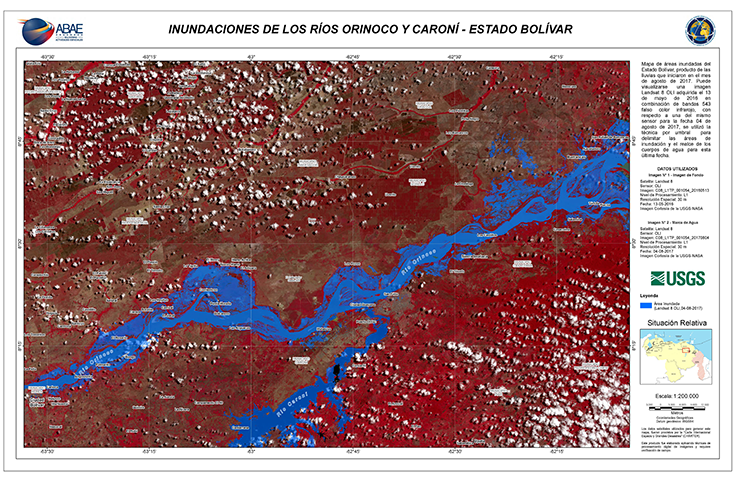 Aug 15, 2017 • The Disaster Charter used Landsat 8 data to map flooding on the Orinoco and Caroni Rivers in Venezuela with data acquired on August 4, 2017. The International Charter: Space & Major Disasters, known simply as the Disaster Charter, is a system that supplies free satellite imagery to emergency responders anywhere in the world.